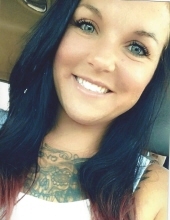 Sarah Faye Blevins, 25, daughter of Byron Blevins and Amanda Loudermilk, passed away Wednesday, November 6, 2018. She was born May 9, 1993 in Fayette County, Kentucky. Sarah was a graduate of Bryan Station High School. Along with her parents, she is survived by sons, Bentley Campbell and Jordan Wynn, both of Sadieville, Kentucky, brother, Chad Mulligan of Lexington, Kentucky, and sister, Amanda Neace of Georgetown, Kentucky. To send flowers or a remembrance gift to the family of Sarah Faye Blevins, please visit our Tribute Store. "Email Address" would like to share the life celebration of Sarah Faye Blevins. Click on the "link" to go to share a favorite memory or leave a condolence message for the family.